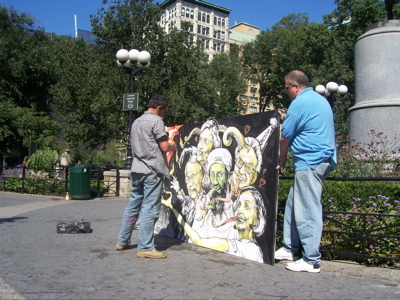 Painting in the park | Error Ink. No dung flew in Union Square this morning, nor were handcuffs latched behind the back of Scott LoBaido. 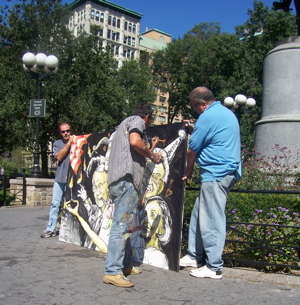 LoBaido, a right-wing antagonist and artist, unveiled his most recent painting, “Love Fest” at noon on 14th Street and Broadway to a crowd more enthralled with a commercial shoot for the anti-tobacco campaign, TheTruth, than his rendering of Hillary Clinton and other prominent Democrats setting fire to an American flag and consorting with Osama bin Laden. LoBaido is making a career of lambasting the left with paintings like “KO,” a portrait of President George W. Bush knocking out Michael Moore and “200 MPH,” a depiction of President Bush as a racecar driver about to run over the Democratic donkey. This newest piece points blame at the Democratic Party for failures in American foreign policy. “Our troops would have been home two years ago if it wasn’t for jackasses like this,” said LoBaido, as he pointed to Senators Clinton and Harry Reid, Speaker of the House Nancy Pelosi and billionaire George Soros. 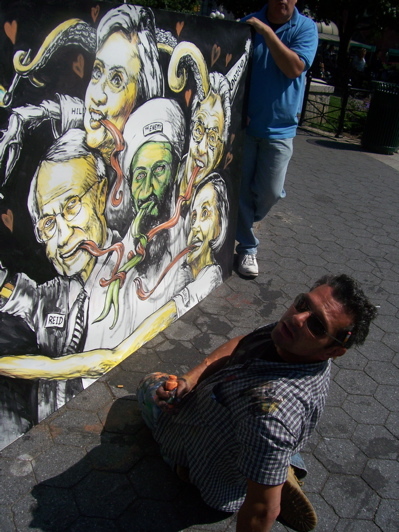 LoBaido’s art and protest has led to his arrest more than a dozen times, such as when he threw horse dung at the Brooklyn Museum of Art in 1999. However, this outdoor opening provoked nothing more than the nods of approval or distaste from passing pedestrians. “I agree with it,” said Rosemary Quinn. Shareef Muhammad felt differently. “I think it is a good painting, but they don’t have the enemy of the state on there. They don’t have George W. Bush,” he said. “‘Why is Hillary Clinton there? I don’t get it. Hillary isn’t bad, but Bush is nasty,” said Dan Ruggiero. “This is really nasty. I think it’s disgusting,” said Amy Gigante.